We finished up Friday with a volunteer session for checking in the Hoopfest Court Monitors. With nearly 650 Court Monitors registered to work Saturday and Sunday, their team has the check in system completely dialed in from training to getting the monitors their gear to making sure they have everything they need from whistles to sunscreen. From there we took a quick walk around downtown as the logistics team gets their set up preparation done. It is incredible how the entire town gets behind this tournament. From the city letting Hoopfest store their baskets in city storage, to staging the night before to rearranging the city transit schedule and bus routes, Spokane has completely bought in. They even let them banner the downtown light posts and put up speakers on every street! The city's reward? 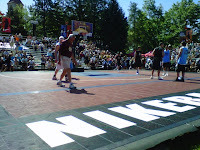 An estimated $39 million in additional revenue during the weekend generated specifically by Hoopfest. 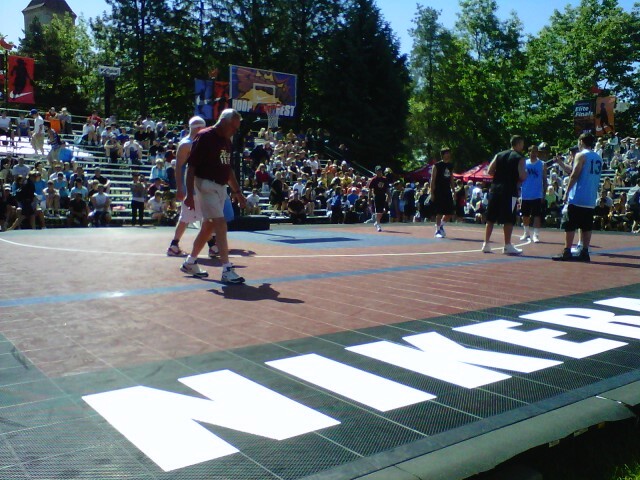 Saturday, the first official day of Hoopfest couldn't have gone better for the BAM Jam crew. The day started with a ride on their modified city transportation. Normally, a day pass on their transit system costs $3.50. During Hoopfest it is just $1.50 and in 10 minutes you can get all the way downtown. The first shift starts at 8:00 AM with a volunteer session at the data entry center. The Hoopfest bracketing/tournament results are completely digital. They strive to have all brackets updated within about 10 minutes of the score sheets being turned in. This is quite a challenge with 485 brackets and sheets coming in every 30 minutes. We had 10 volunteers entering game results into their custom made software and were able to keep up. All the results are available online and they added a mobile application this year. Next year they plan to add text messaging as well. The BAM Jam Boise Dot Com team also did very well. They are competing in the Elite Division and were ranked #2 this year after finishing second last year. Their first two games were on the Nike Center Court and went 2-0 to finish the day. While the offense was OK it was their defense that proved to be most effective. Sunday they open against another Treasure Valley team at 10:00 AM (Pacific Time). If they win their first three games they will be back in the final four. A loss and they'll have to battle through the losers bracket. Several Treasure Valley teams are still in the hunt for this year's Hoopfest title including Still OC (Keegan Cook), Gates of Hope (Joel Ryman), STADIAdotcom (Ryan McCarthy and Wade Joseph), Wheatland Bank (Cory Violette and Dan Mcfaul) and BodyBuildingdotcom (Booker Nabors) along with BAM Jam Boise dotcom (Matt Bauscher, Clint Hordemann, Jon DeWolfe and Paul Noonan). But the defending champs, Tonicx (David Pendergraft), is still alive and takes on Wheatland Bank first thing Sunday morning. And of course don't forget that BAM Jam will take place in Boise on August 5-6 where you can see or even compete against some of these same players.